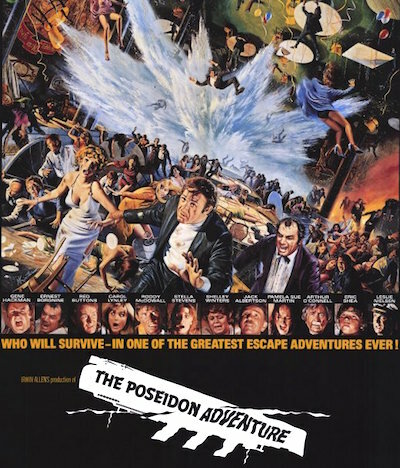 The Poseidon Adventure was the film that established the basic conventions of the disaster genre, i.e. a group of A-list stars in peril. In this case, they're guests on a luxury liner which is capsized by a tidal wave. One of the highlights comes when Gene Hackman realises that, if they propped up a large Christmas tree, they could climb up it and reach a ledge that led to a potential exit. He convinces a small group to climb up, but most of the others won't listen to him. He tries one last time to make them see sense, but they still ignore him. So he climbs up the tree himself, and, from the ledge, he pauses to look down contemptibly at them. Then there's an explosion, and the scene below him looks like Sodom and Gomorrah in hell - a writhing mass of burning people. Hackman turns his back on them and goes through a door to safety... and then he closes the door behind him! It's one thing to turn his back on them, but closing the door on them as well seems a bit harsh. (Hackman's character is a priest, after all.) It's a very funny moment, though, and the film is worth seeing despite most of the acting (apart from Hackman and Shelley Winters) being a bit ropey. It also has Leslie Nielsen as a deadpan ship's captain at the start, so you think it's going to be a parody but in fact it isn't (not intentionally, anyway).